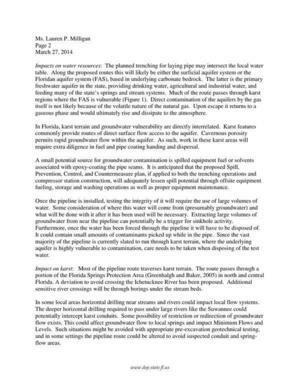 Filed with FERC 18 April 2014 as four pages of the 74-page “Florida State Clearinghouse comments on Dockets # PF14-1, et al Notice of Intent to Prepare an Environmental Impact Statement for the Planned Southeast Market Pipelines Project (Sabal Trail and Florida Southeast Connection Projects).” Some of it was also submitted to FERC by Florida’s Suwannee River Water Management District, but there is new material here; especially that superimposition map. From: Frank Rupert, P.G. and Guy Means, P.G. We have reviewed preliminary draft resource reports related to the Southeast Markets Pipeline (SMP) project, Federal Energy Regulatory Commission — Dockets Nos. 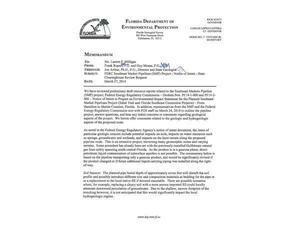 PF14-1-000 and PF14-2-000 — Notice of intent to Prepare an Environmental Impact Statement tor the Planned Southeast Marlket Pipelines Project (Sabal Trail and Florida Southeast Connection Projects) — From Hamilton to Martin Counties, Florida. In addition, representatives from the SMP and the Federal Energy Regulatory Commission met with FGS staff on March 24, 2014 to outline the pipeline project, answer questions, and hear any initial concerns or comments regarding geological aspects of the project. We herein offer comments related to the geologic and hydrogeologic aspects of the proposed route. As noted in the Federal Energy Regulatory Agency’s notice of intent document, the items of particular geologic concern include potential impacts on soils, impacts on water resources such as springs, groundwater and wetlands, and impacts on the karst terrain along the proposed pipeline route. This is an extensive project, traversing many geomorphic zones and varying terrains. Some precedent has already been set with the previously-installed Gulfstream natural gas lines safely spanning south-central Florida. As the product is in a gaseous phase, direct petroleum liquid contamination of subsurface aquifers is not possible. The commentary below is based on the pipeline transporting only a gaseous product, and would be significantly revised if the product changed or if future additional liquid-carrying piping was installed along the right-of-way. Soil Impacts: The planned pipe burial depth of approximately seven feet will disturb the soil profile and possibly introduce different size and composition materials as bedding for the pipe or as a replacement to the local native fill if deemed unsuitable. There are possible scenarios where, for example, replacing a clayey soil with a more porous imported fill could locally attenuate downward percolation of groundwater. Due to the shallow. narrow footprint of the trenching however, it is not anticipated that this would signifcantly impact the local hydrogeologic regime. Impacts on water resources: The planned trenching for laying pipe may intersect the local water table. Along the proposed routes this will likely be either the surficial aquifer system or the Floridan aquifer system (FAS), based in underlying carbonate bedrock. The latter is the primary freshwater aquifer in the state, providing drinking water, agricultural and industrial water, and feeding many of the state’s springs and stream systems. Much of the route passes through karst regions where the FAS is vulnerable (Figure 1). Direct contamination of the aquifers by the gas itself is not likely because of the volatile nature of the natural gas. Upon escape it returns to a gaseous phase and would ultimately rise and dissipate to the atmosphere. 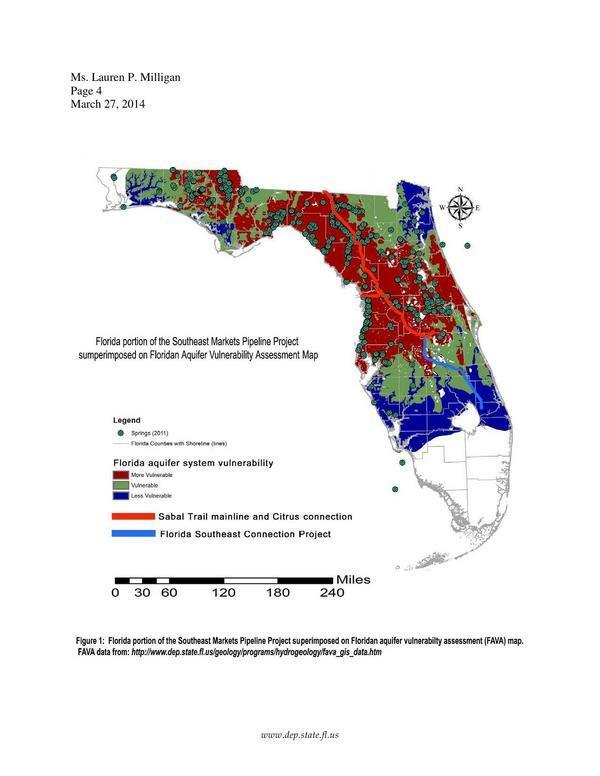 In Florida, karst terrain and groundwater vulnerability are directly interrelated. Karst features commonly provide routes of direct surface flow access to the aquifer. Cavernous porosity permits rapid groundwater flow within the aquifer. As such, work in these karst areas will require extra diligence in fuel and pipe coating handing and dispersal. A small potential source for groundwater contamination is spilled equipment fuel or solvents associated with epoxy-coating the pipe seams. It is anticipated that the proposed Spill, Prevention, Control, and Countermeasure plan, if applied to both the trenching operations and compressor station construction, will adequately lessen spill potential through offsite equipment fueling, storage and washing operations as well as proper equipment maintenance. Once the pipeline is installed, testing the integrity of it will require the use of large volumes of water. Some consideration of where this water will come from (presumably groundwater) and what will be done with it after it has been used will be necessary. Extracting large volumes of groundwater from near the pipeline can potentially be a trigger for sinkhole activity. Furthermore, once the water has been forced through the pipeline it will have to be disposed of. It could contain small amounts of contaminants picked up while in the pipe. Since the vast majority of the pipeline is currently slated to run through karst terrain, where the underlying aquifer is highly vulnerable to contamination, care needs to be taken when disposing of the test water. Impact on karst: Most of the pipeline route traverses karst terrain. 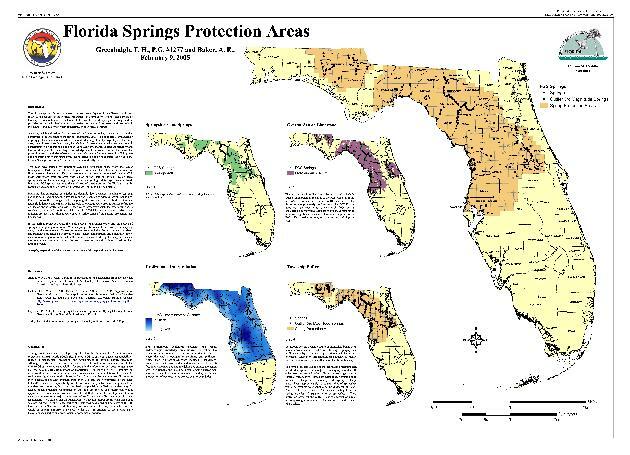 The route passes through a portion of the Florida Springs Protection Area (Greenhalgh and Baker, 2005) in north and central Florida. A deviation to avoid crossing the Ichetucknee River has been proposed. Additional sensitive river crossings will be through borings under the stream beds. In some local areas horizontal drilling near streams and rivers could impact local flow systems. The deeper horizontal drilling required to pass under large rivers like the Suwannee could potentially intercept karst conduits. Some possibility of restriction or redirection of groundwater flow exists. This could affect groundwater flow to local springs and impact Minimum Flows and Levels. Such situations might be avoided with appropriate pre-excavation geotechnical testing, and in some settings the pipeline route could be altered to avoid suspected conduit and springflow areas. Portions of the route may pass through shallow karst with extensively developed cavernous porosity. Shallow caves may be of sufficient size to preclude installing effective support for the pipe. Grouting in cavernous porosity zones may be ineffective. Excessive grout pumping may cause localized groundwater contamination if pumped into flow systems. Horizontal directional drilling in cavernous karst has potential to trigger sinkhole formation or disruption of natural groundwater flow patterns. Paleo-sinkholes in karst terrain may contain significant vertebrate fossil deposits. 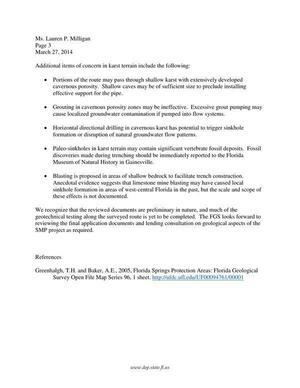 Fossil discoveries made during trenching should be immediately reported to the Florida Museum of Natural History in Gainesville. Blasting is proposed in areas of shallow bedrock to facilitate trench construction. Anecdotal evidence suggests that limestone mine blasting may have caused local sinkhole formation in areas of west-central Florida in the past, but the scale and scope of these effects is not documented. We recognize that the reviewed documents are preliminary in nature, and much of the geotechnical testing along the surveyed route is yet to be completed. The FGS looks forward to reviewing the final application documents and lending consultation on geological aspects of the SMP project as required. The fourth page is the appended map of “Florida portion of the Southeast Markets Pipeline Project superimposed on Floridan Aquifer Vulnerability Assessment Map“. The vulnerability of the Floridan Aquifer doesn’t stop at the state line, either: it continues right up through Lowndes County in Georgia. As I’ve said all along: reroute it into the Gulf and then cancel it. You are very welcome! Much of the credit must go to John S Quarterman who created this site. I am an additional blogger here. We are very happy to be of service! Please share our blogs to help inform the public of what is really going on with fracked gas and oil, pipelines and the ‘endgame’ of all which is to export gas and oil to other countries at zero benefit to the public.